UPDATE: Submissions for this year’s Shorties have now closed. 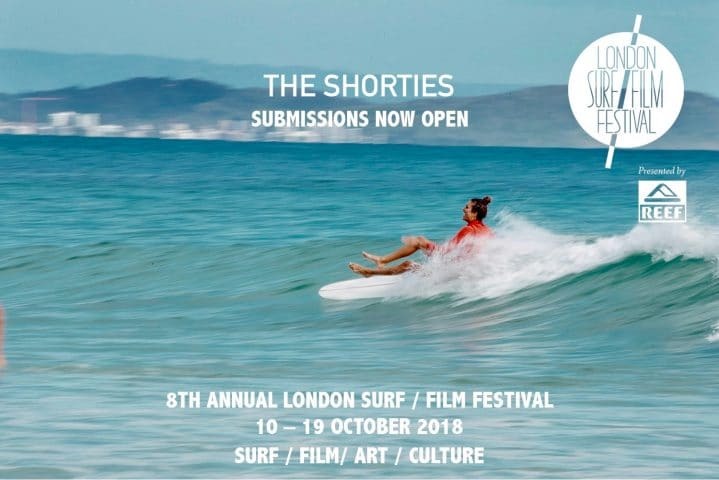 Submissions to the 2018 London Surf / Film Festival x Reef Shorties short film competition are open. Now in its 8th year, this prestigious annual event has fast become the showcase for homegrown filmmakers. Until 31stAugust filmmakers from or based in Britain and Ireland are invited to submit their short films of up to 5 minutes in length that explore any aspect or angle of surfing through documentary, comedy, action, arthouse, animation or anything in between. It’s not about whether your waves are big or small, it’s about the way you chose to shoot them. Or don’t. After all there’s more than one way to tell a surf story. “It’s a testament to quality of filmmaking on show that each year the winning Shortie, as well as many of the shortlisted films, have gone on to make an impact on both a national and global level,” says Demi Taylor. Shortlisted films will be showcased on the big screen this October as part of the 2018 London Surf / Film Festival x REEF programme. They will also be considered by the screening panel, comprised of some of the most influential names in surfing and independent filmmaking, for awards including LS/FF Shortie of the Year, Best British Film and Emerging Talent.